Favors, Loot Sacks, Costume Dress-Up & More. 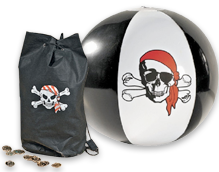 Celebrate on the high seas with pirate-themed party supplies and party favors from 1SuperParty! We have all sorts of loot and treasures for seafaring lads and lasses. From costume jewelry to loot sacks, play coins, play swords, masks, hats, and more. Pirate fun for all wee swashbucklers! Yarr! Shop 1SuperParty for bulk party favors for your little one’s next pirate adventure.